Caledonia Sectorial Starter Pack. New release! A new miniature box containing a compilation of previously released figures. The best choice to start the Caledonian Highlander Army, the new Scottish Ariadnan Sectorial army. In this box you’ll find 3 Caledonian Volunteers (Two with Rifle and one with Chain Rifle) the basic troopers of the Ariadnan Scottish; 1 Highlander S.A.S. with Boarding Shotgun, a infiltrator specializing in Close Quarters Combat; 1 Highlander Grey with AP HMG, a fast and well armoured Heavy Infantryman armed with one of the most powerful weapons in the Ariadnan armory; and 1 Wulver Grenadier with T2 Rifle, a hybrid human-Dogface warrior and a tough assault trooper. 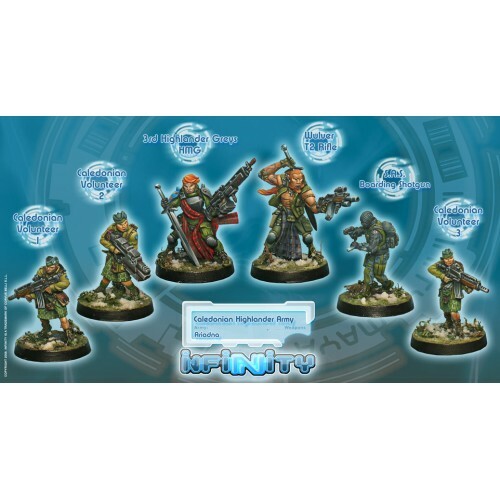 This Starter box is the best way to begin collecting a complete Caledonian Highlander Army. Unleash the unstoppable fury of the Highlander warriors!